SYDNEY-BASED ANTONY LOEWENSTEIN is the author of the best-selling book, My Israel Question, a controversial discussion of one of the most important issues of our time, as well as The Blogging Revolution, a searching examination of the ways the internet is threatening the rule of some of the planet’s most repressive governments. He actively seeks news on the ongoing conflict between Israel and Palestine, two countries everyone knows about but seldom chooses to engage. Loewenstein’s interest in writing goes back a long time, including being an editor of his university newspaper in Melbourne, Australia, in 1997. He says, “I often liked the idea of provoking and challenging readers, especially about supposedly accepted ‘truths.’ For me, journalism should always be about shining light in the darkness and challenging the establishment, no matter who runs the joint.” This led him to becoming a journalist in 2003 and he has used various media, including the revolutionary transparent media of blogging, to get his reports out there. With an endless archive of information, the World Wide Web is chaotic and unpredictable, but Loewenstein celebrates this. “Information overload happens to me all the time but it’s a generally pleasurable experience. The best journalists and writers are always the ones with the most facts and figures at their fingertips,” he states, and believes that readers can learn how to discern reliable and nonsensical web resources. “This is something that one learns over time, though this is no different to trusting certain newspapers and not others.” If in doubt, The Blogging Revolution makes a good reference. 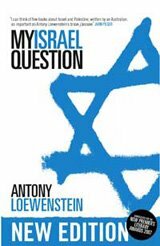 His preoccupation with the Israeli state led to My Israel Question, which was a significant achievement for this journalist when he got shortlisted for the 2007 New South Wales Premier’s Literary Award. “It was pleasing to be shortlisted for my best-selling book, especially after so many conservative hacks and Zionist lobbyists tried to smear it.” In fact, the criticism of My Israel Question “backfired spectacularly,” as the book has gone on five reprints and two editions. The author is confident that it hasn’t run its course. For Loewenstein, who bases his arguments on justice and humanity, Israel has been occupying Palestinian land in the name of “security” when the truth about Zionism “has always been about expansionism and conquest. However, the West also has its advantages. Although outspoken journalists aren’t always popular, they can escape repressive regimes found in persecuting nations. “Find Western allies to cause a noise if you are arrested or intimidated. Remember that your readers value transparency and honesty,” Loewenstein advices. For his research, Loewenstein travels regularly overseas because “far too many journalists and bloggers pontificate from their offices, not realising that often they’re only having their prejudices confirmed, not challenged. Being on the ground is essential to understanding different cultures.” For My Israel Question, he spent two months in Lebanon, Israel and Palestine for research; and for The Blogging Revolution, his research on the web in repressive regimes took him to Cuba, Egypt, Syria, Iran, Saudi Arabia and China. TAN MAY LEE graduated from the University of Leeds, United Kingdom, where she was awarded the Bonamy Dobree Scholarship for International Students to do her Bachelor of Arts in English Literature and Language. She also trained as a Master Practitioner in Neuro-Semantics Neuro-Linguistic Programming. Her story, “From the Roof,” was recently anthologised in Urban Odysseys: KL Stories (MPH Group Publishing, February 2009).